Thank you for your interest in our outstanding CMC students and alumni! CMC Career Services is housed within the Soll Center for Student Opportunity, a student-focused hub in the center of campus, and offers an array of services designed to facilitate your access to CMC's top quality students and academic programs. Organized around eight "interest clusters", our office combines the same full range of services provided by large universities, with heightened student connection and customized approaches that enable employers to recruit efficiently and easily. To get started, please register as an employer via Handshake or contact Employer Relations Coordinator, Charlene Kile. We look forward to partnering with you in your recruiting efforts at CMC! CMC students learn by the unique liberal arts philosophy of “learning for the sake of doing.” Our students are excited to extend their learning beyond the classroom and realize that experience enhances their theory and research. Of course, in exchange for these services, and for the benefit of our students, we ask that you adhere to the Claremont Colleges Recruiting Policies. Please review them before engaging with our campus and let us know if you have any questions or concerns. We have also recorded a presentation that provides some best practices regarding how to make internship offers to students! CMC students pursue a variety of paths post-graduation. We encourage you to review our Outcomes information. CMC's mission is to educate students through the liberal arts for responsible leadership roles in business, government and the professions, a unique and important position in American higher education. These outward-looking fields attract students who are pragmatic in the way they approach their education and who seek to make a difference in today's world. With enrollment around 1300, CMC students are a geographically, socio-economically and ethnically diverse group and tend to be ambitious, practical, aware and leadership-oriented. CMC is one of The Claremont Colleges, a cluster of autonomous colleges, each of which excels in a particular academic niche. 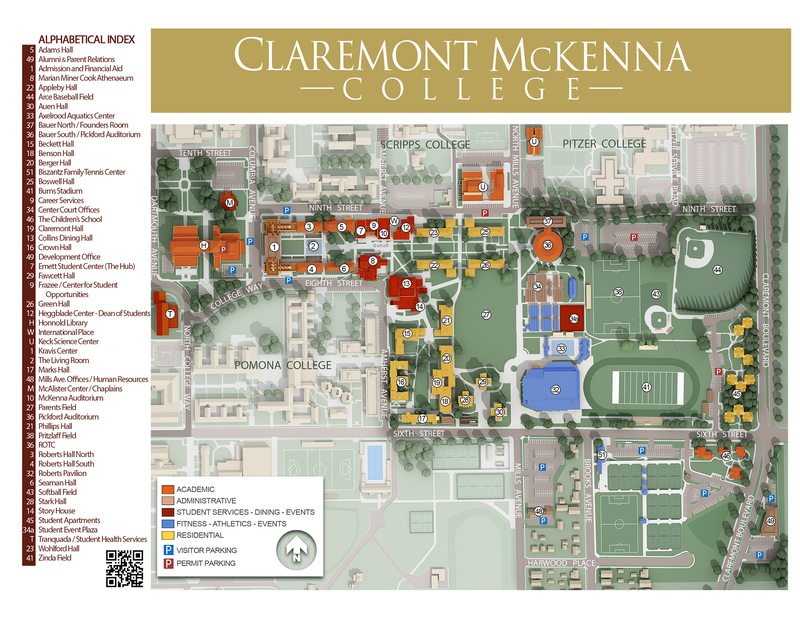 The Claremont Colleges include Claremont McKenna College, Harvey Mudd College, Pitzer College, Pomona College, Scripps College, Claremont Graduate University and Keck Graduate Institute. Each has its own student body - ranging from approximately 700 to 1,900, its own faculty, trustees, campus, curricular emphasis, distinctive style and mission, yet the campuses share approximately one square mile of land, cooperating to provide the services and facilities of a 6,000-student university.